The trucks have to be parked outside DSNY’s Queens West District 1 Garage at 34-28 21st Street because the building doesn’t have enough space to house all the garbage trucks and equipment. Residents of a public-housing development in Queens are wondering when the city will make good on its promise to stop using a busy local street as a holding area for up to two-dozen garbage trucks. The de Blasio administration says relief for a problem that emerged years ago is coming soon. Between 15 and 23 garbage trucks can be seen most days parked near the intersection of 35th Avenue and 21st Street near the NYCHA’s Ravenswood Houses. Some trucks are also parked along 24th Street. Sundays are the only days of the week when DSNY truck parking is not a problem. During the rest of the week, trucks are only moved when they are dispatched for garbage pickup around the community at different days and hours. Residents of the housing development have been complaining for more than 10 years to city officials and DSNY commissioner about the smells and noises caused by the trucks, and the accumulation of trash, oil spills, traffic and fire hazards that those trucks pose for the community. The current building has been used by DSNY since the 1930s. According to Queens Community Board 1 District Manager Florence Koulouris, CB1 has been advocating for numerous years to build a new garage since the building is dilapidated. Cadiz, and her husband, Edwin Cadiz, a member of Queens Community Board 1 and community liaison for Assemblywoman Catherine Nolan, circulated a petition from 2015 to 2017 collecting more than 1000 signatures from residents of the public housing development. They garnered attention from pols like Nolan, City Councilmember James Van Bramer and Congresswoman Carolyn B. Maloney. Indeed, at an April 2017 town hall meeting at Queens Vocational High School held by Van Bramer, Mayor de Blasio said that there was $130 million in the executive budget allocated for the garage to be placed in another facility. That amount has been raised to $142.6 million, according to DSNY Spokeswoman Belinda Mager. At the meeting, De Blasio promised that those trucks will be moved out of Ravenswood Houses by Sept. 2017, but his promise didn’t come to fruition because they couldn’t find a space to put those trucks in. 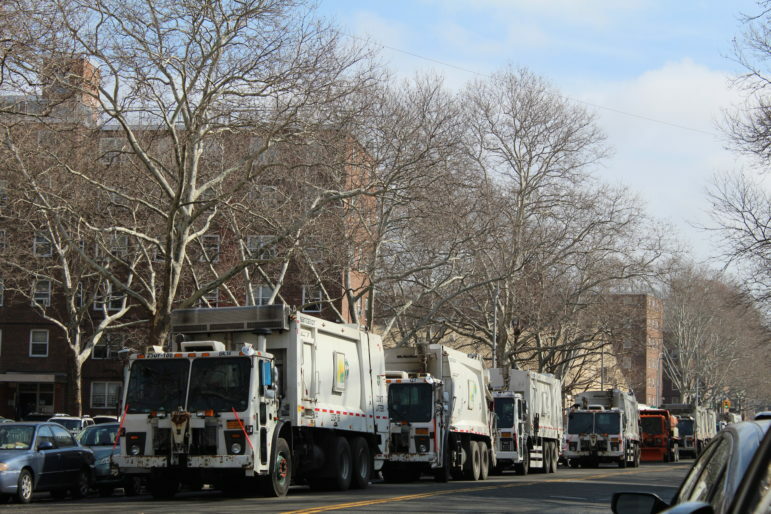 DSNY has finalized a license agreement to move at least 25 garbage trucks from the Queens West District 1 garage to a site near Luyster Creek in Astoria by May, according to a Feb. 13 letter from the DSNY to Van Bramer. The letter further states that DSNY is still looking for a new site to allocate the QW1 garage, and predicts that construction for a new QW1 depot could start in 2021. Koulouris says she is very confident that those trucks will be moved soon since the DSNY has been provided with the awaited funding. The Cadizes said that their next move will be to file a class action suit if they don’t see any results in the near future. This story was generated by a tip to the City Limits website. The DSNY takes forever to site and build new facilities. The problem is that understandably no one wants a DSNY garage near their home. Placing them in maufacturing/industrial areas is usually the best solution. The DSNY has been talking for over 10 years about moving the Jersey Street (SI-1) garage to a new location but only now has firm plans to relocate it to the Fresh Kills facility, where the SI-2 and SI-3 garages operate. Perfect location for that kind of facility away from homes and businesses and accessible by wide commercial streets and the West Shore Expwy.